Born: 10th December 1892, 25, Wandsworth Bridge Road, Battersea, Surrey. Baptised: 26th February 1893, at St. Philip Battersea, Surrey. Parents; Mary Ann & John Frederick Cheesman – Clerk – Union Workhouse. Died: 25th January 1918; age 26; Killed accidently while flying at Catterick, Yorkshire. Residence: Barham House, Claydon, Suffolk. Certificate taken on the Beatty-Wright Biplane, at Beatty School, Cricklewood, Hendon. 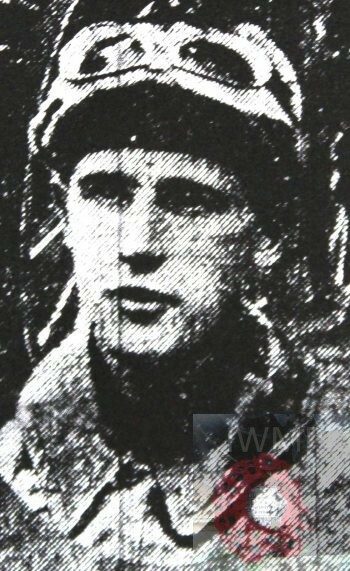 – 27th June 1917. Formerly Royal Engineers, 67376, Sergeant. Service: R.E., 151st Field Cop, – France – December 1915 – April 1917. 1911 The Union Workhouse, Chilvers Coton, Nuneaton, Warwickshire. John was 18 years old, an Officer – Workhouse Clerk – Poor Law. He was 1 of 8 Officers employed by 39 year old, Frederick William Allen – Master of The Union Workhouse – which housed 30 patients & 62 inmates. 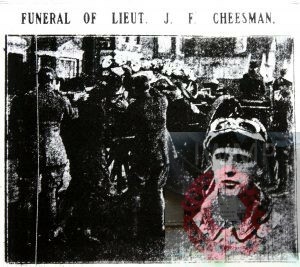 John’s father was John Frederick Cheesman, born September 1856, at 10, Park Terrace, Chelsea, Middlesex – died, May 1921, Norwich Road, Ipswich. John’s mother was Mary Ann Cheesman (nee Pilgrim), born 1864, Fulham, Middlesex – died, September 1948, Ipswich. On both the 1901 & 1911 census, John & Mary were Master & Matron of The Barham & Claydon Union Workhouse, Barham, Suffolk. The funeral of Lieut. 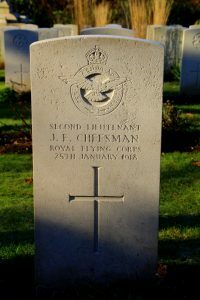 John Frederick Cheesman, R.F.C., who met with his death on Friday in a flying accident, took place at the Ipswich Cemetery on Wednesday. The remains were brought to Ipswich on Monday. The flags at the North Country aerodrome floated at half mast, and a party of officers and men, representing various squadrons, went to the railway station and lined up and saluted as the coffin was carried to the train. At Ipswich the remains were interred with full military honours, the coffin, covered with the Union Jack, being borne on a gun-carriage with out riders, supplied by the 395th Battery, R.F.A., by permission of Colonel Manley, the officer commanding. A firing party of forty men, under Lieut. Veich and Sergt. Hurst, with buglers, was sent by the Northumberland Fusiliers, by permission of Col. Hay, O.C. Eight flight-sergeants acted as bearers. Owing to the deceased officer having seen two years service in France the body was interred in the Field of Honour. The service was held at All Saints’ Church, the officiating clergy being the Rev. C.R. Phillips and Rev. W.J. Chapman rector of Hemingstone. The mourners were:-Mr. and Mrs. J.F. Cheesman (father and mother) the Misses M., N., and E. Cheesman (sisters). Masters H., E., and A. Cheesman (brothers). Lieut. B.C. Self (representing the 52nd Training Squadron, Mrs Purchase, Mrs Mayhew, Mrs Pearce (aunts). Mr. and Mrs. Garling, Miss Garling, Mrs F. Graver, Corpl. F. Grayer, R.E., Mr. and Mrs. Oliver C. Jones, Mr and Miss Timmins, Miss A. Russell and Nurse Williams.There were also present at the church Mr. Pollard Wilkinson, with a party of boys from the Municipal Secondary School, Ipswich; Mr. Fred Ward, Mr. and Mrs G. Quinton, Mr D. Foulger, Mrs Rogers, and others.